Joo Howe was previously the Business Banking Segments Head of Standard Chartered Bank, Retail Banking. His role was mainly focusing on strategies for developing more banking services for SMEs in Singapore. He was also responsible the performance measurement of the sales force. Previously, Joo Howe also worked in the SME department of Standard Chartered Bank (China) as the Segments Manager and also the Head Coach of the SCB Way. The departments that he was tasked in the past include Bancassurance, Performance Management, Remote and Proximity Banking and Relationship Expansion. He also held roles in Citibank (China) such as, Cluster manager in Shanghai and the Deputy Branch Manager, Shanghai. Joo Howe has been in the Singapore and China Banking industry for more than 15 years and more than 25 years in the financial and insurance industry. He graduated from the National University of Singapore, major in Mechanical Engineering, a Certified Financial Planner (CFP) and a Fellow of the Chartered Financial Practitioner (Singapore). 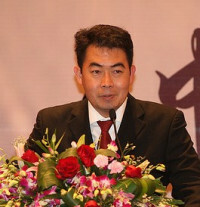 He was the also the Vice President of the Shanghai Singapore Business Association (2007-2008). Currently, he is also the Vice President of SingCham (Jiangsu chapter).